Tonight I'm so happy to be part of Picture Polish Collab-Fest 2013, which is a little end of year celebration for all the Picture Polish collaborators to revisit their collaboration shade and remind everyone about them, all on the same day. 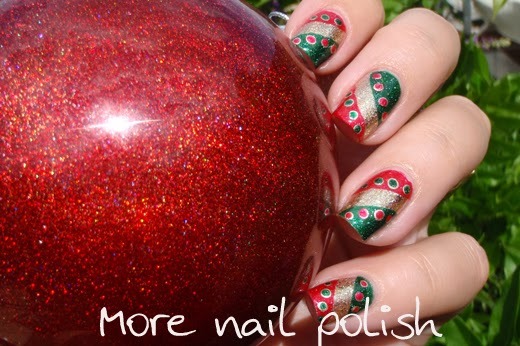 I was lucky enough to be one of the first two bloggers to work with Picture Polish to create a collaboration shade back in July 2012. 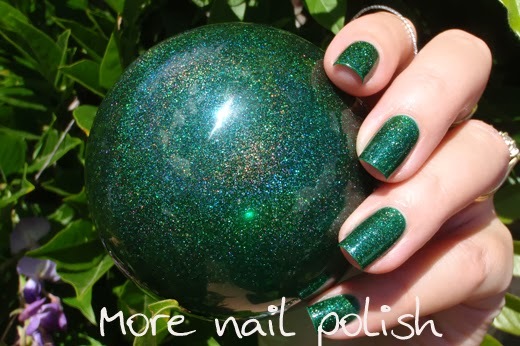 Since that time, there have been more than 30 amazing unique polishes designed with a vast range of bloggers and network members around the world. I'm really looking forward to seeing them all over again today. One thing I especially love about my shade is seeing it appearing on nails all over the world, and I have to say that every mani I've seen wearing it is spectacular!! 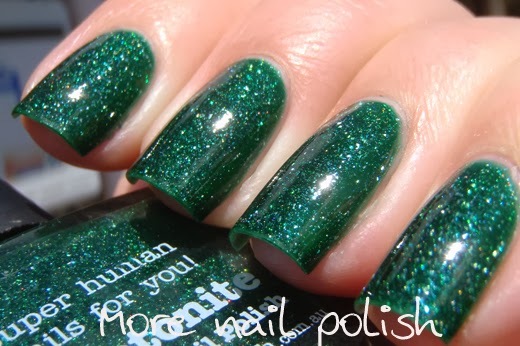 Without further adieu, let look at some new swatches of Kryptonite. 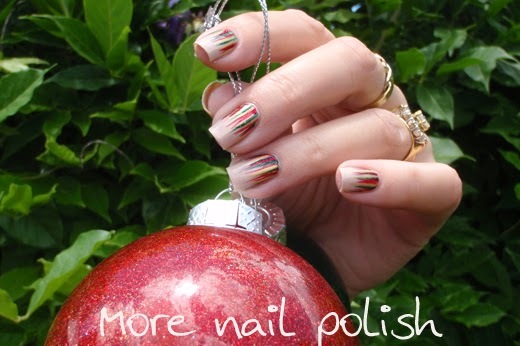 Like a lot of nail polish lovers, this year I've also been excited to create nail polish Christmas baubles. I only made four of them, including this one made with Kryptonite! 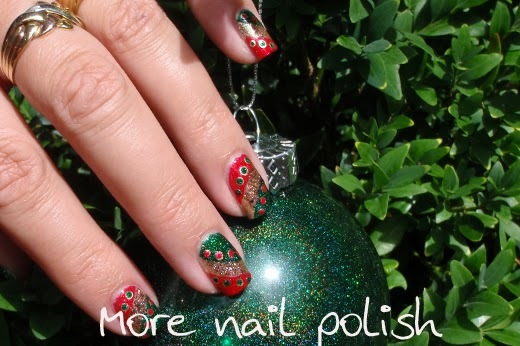 It looks so sparkly and amazing and makes the perfect nail prop. There is something so magical about a glowing sphere of colour, it looks less like a Christmas bauble and more like something out of a Harry Potter movie. 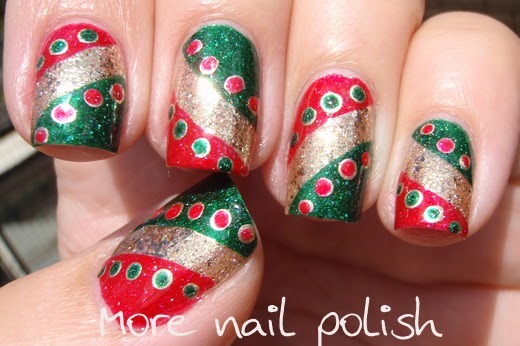 Another thing I can say about my shade is that it is the perfect polish for Christmas nail art. 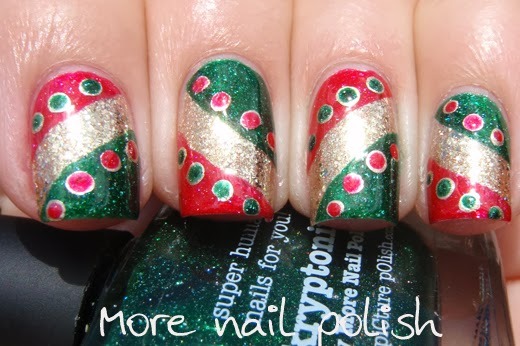 I created two Christmas nail art looks featuring Kryptonite and other Picture Polish shades. 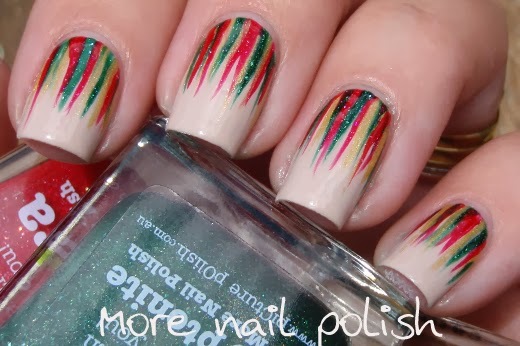 This first one is a Nailasaurus inspired waterfall design. 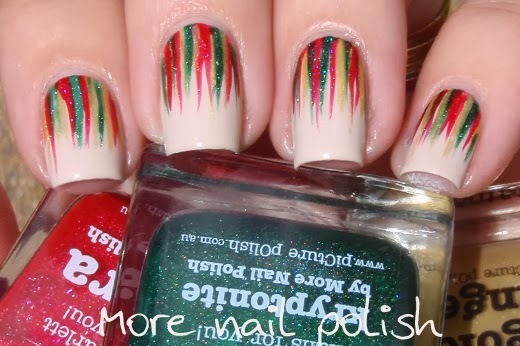 My second nail art look is more abstract. The design is inspired by a pastel one done by Acetone and Old Lacquer back in 2011. 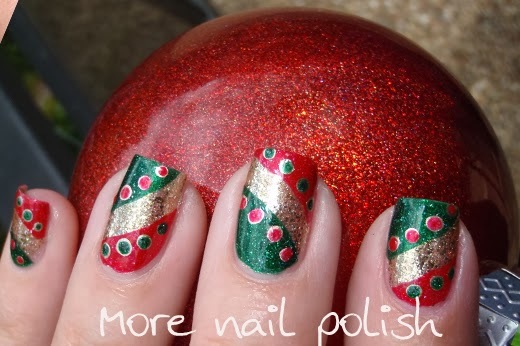 The base is Picture Polish Majesty, I then taped off a curved diagonal using a french tip guide. 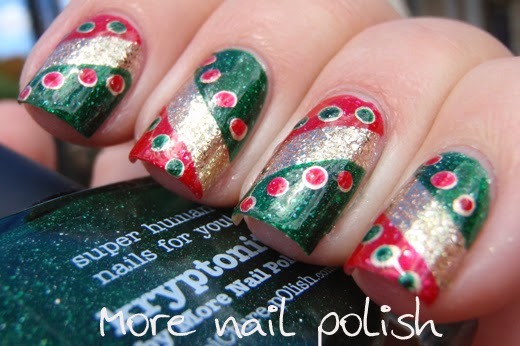 I used kryptonite and o'hara for the two sections and then used a dotting tool in the opposite colours. 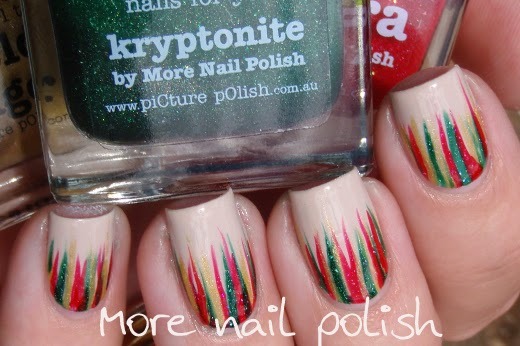 I'd love to know how many of you have a bottle of Kyrptonite, and have you used it for Christmas nail art yet? Also, please check out all the other Picture Polish Collaborators taking part in Collab-Fest 2013 below. I love Kryptonite. 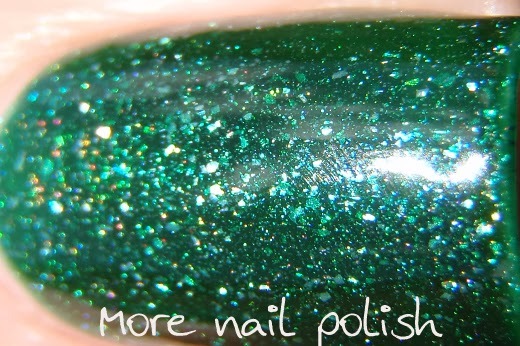 I think it is one of the most beautiful green polishes in the world and one of the best Picture Polish Collaborations. You did a great job with this one. You my get at least one to try, they are lovely! Kyrptonite is still the perfect green! 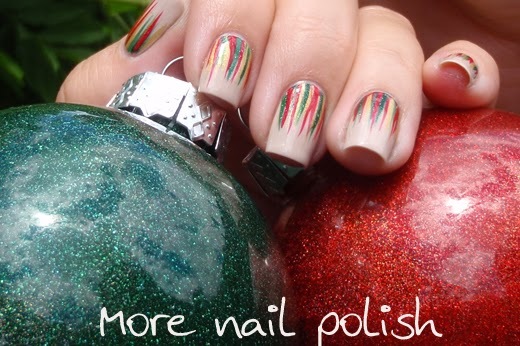 I'll be breaking it out for Christmas :) I love the colours you've used it with. I think it's about time I got Picture Polish Beige. 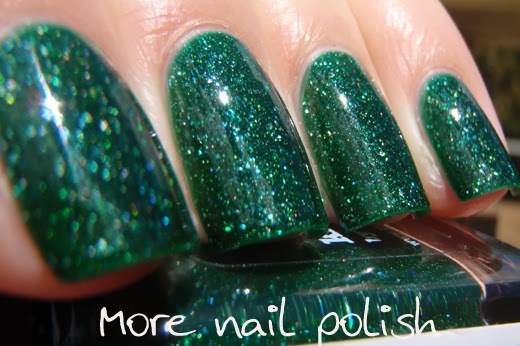 Thank you Rebecca, and I know how much you love your green polishes too. Yes Beige is a beauty, it's a hard pick for me between OPI don't pretzel my buttons and beige. 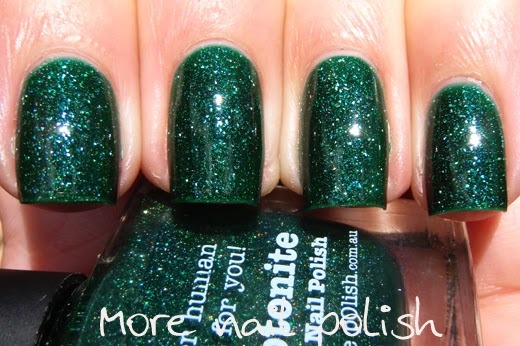 Kryptonite is definitely the "must have" green and how perfect for this time of year. Every one of your arty photos is stunning. Thanks for noticing my attempt at arty photos! Would you possibly post a tutorial for how to make the ornaments? 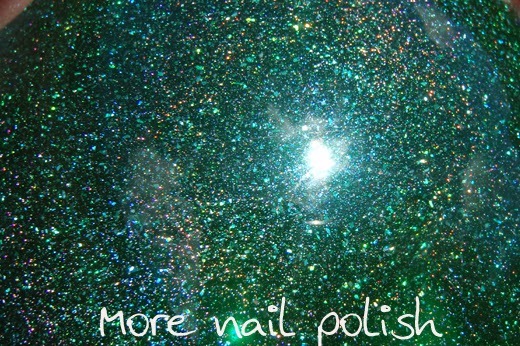 How much polish do they take to make? They're awesome! Here is the tutorial I first saw, it's very good. Just gorgeous Cathy! 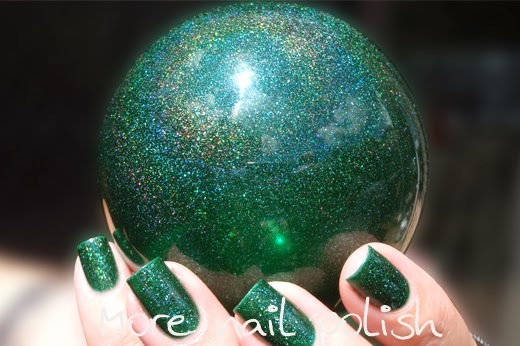 Kryptonite is such a beautiful green and your nail art is impeccable as always!